The first time I heard Tom Russell‘s song, “Finding You” was through the walls of our little train cabin as we barreled through the northwestern mountains headed for Portland. My Music Man slept sublimely across from me in our petite bunk while I read quietly and watched the mountains fly by our window. The song was being played softly by our next door neighbor, Hans, whom we had just met the day before. Separated by a meager partition, we were merely one day into the trip and a certain level of intimacy was inevitable. Listening to Hans’ guitar penetrate our morning brought a slow sweet sob effervescing from inside the core of my heart. It was one of the most hauntingly beautiful songs I had ever heard and watching my lover sleep, I felt a deep sense of gratitude for the couple next door and the love they expressed with a simple song. As the song ended, I tiptoed next door to peek inside and thank them for sharing it with me. And that’s when I felt it — these precious people and their love for each other was tumbling out of the room. I saw it in their eyes, felt it in their welcoming smile and I wanted to know them forever. Sometimes falling in love with someone leaves that indelible tattoo on your soul that seeps into your essence. Hans and Marita Fredriksen had that effect on me. Last week in Houston, Texas as My Music Man and I stood in what we agreed was the longest airport security line of our combined lives trying to get home after a grueling tussle with United Airlines amid cancellations and miscommunications, I received an email from Hans. 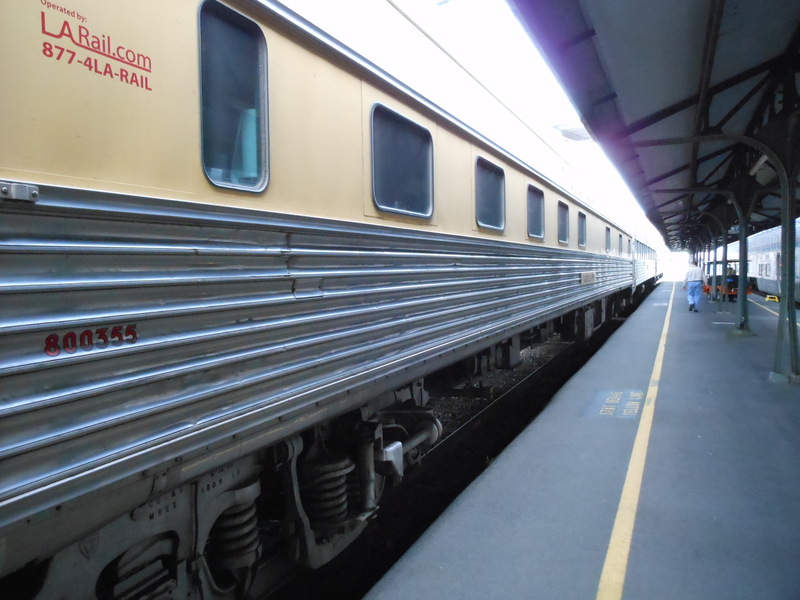 He told of recurring dreams about moving luggage around on the train and described his surprising connections with several specific passengers on the train, and he included us. Reading the email aloud as we stood in that monstrous line, I was struck by the stark contrast to the mellow train trip adventure from only a couple of weeks before. The familiar warmth of friendship and deep gratitude for Hans’ beautiful and perfectly timed email reminded me of how the song became a strand of gold braided throughout the trip, beginning with the morning I first heard it through the walls. Hans Petter Fredriksen serenades me. 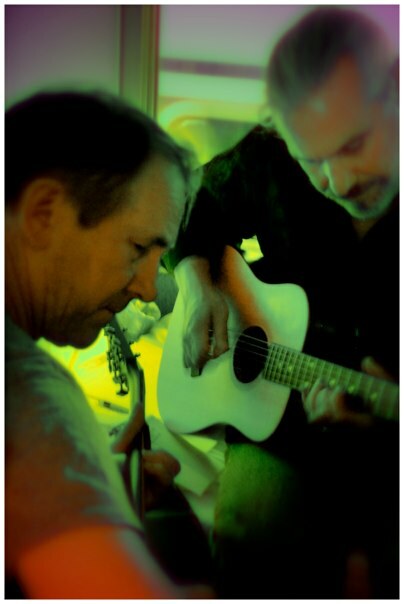 I loved when Hans would play his guitar, encouraged him often, and even requested (okay, begged for) a daily wake-up song. It turned out that I was likely the reason he got in trouble for playing in the sleeping compartments once we were parked in Portland. Hans recounted that being asked to keep quiet by the “Powers That Be” left him feeling discouraged and frustrated, not wanting to play at all. 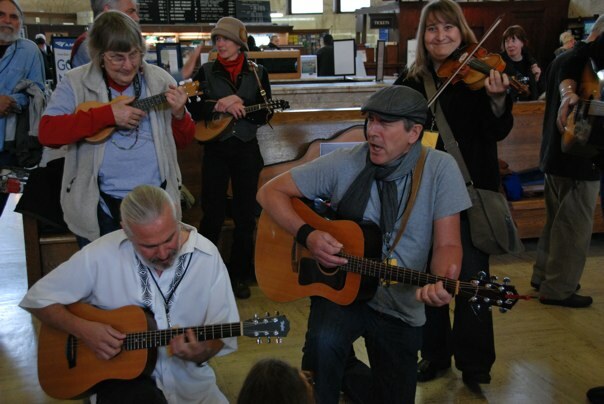 But, as he tells it, he entered Portland’s Historic Union Station for our return trip to L.A. and was ambushed by my own sweet Music Man insisting he play with the group in the middle of the station, “busking” as it is called. 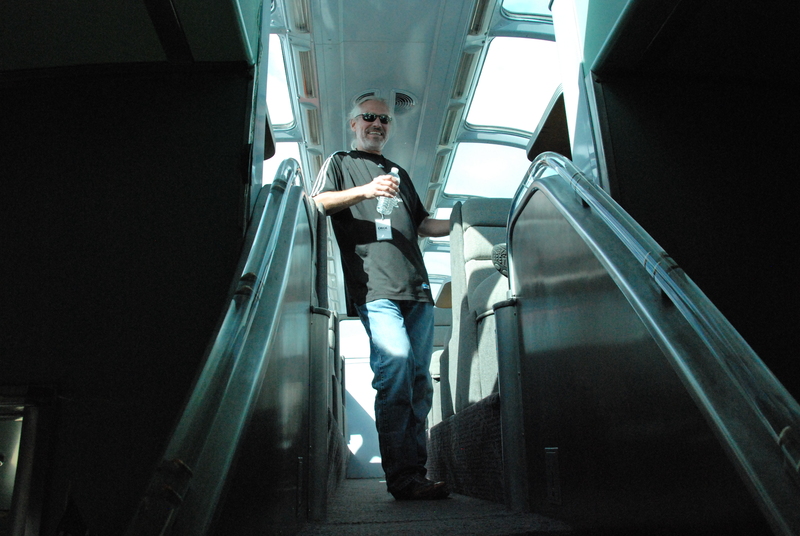 “… everybody was out in the station, playing, taking pictures and having a grand time. Chick spotted us. He came up and pushed his guitar into my arms. ‘Come on Hans, play!! !’ he said, reading me like an open book! I slowly started to play, but it was hard to get my spirit up and feel I was really there. I then spotted [Chelsea] at the station, and it struck me, “it’s now or never!” I hurried Chick’s guitar back to him and asked to borrow “the professional busker‘s” guitar for a minute, which by the way was out of tune, and approached you all (this is not exactly the way it happened, but it’s how the story goes). ‘Chick,’ I said, ‘we’ll play “Finding You” for Chelsea – are you with me?’ ‘I’m right behind you!’ Chick said, ‘and Elsabe is here on the fiddle!’ We started to play the intro, starting out in a slow waltz tempo … ‘They’re blessing the animals, in the old Cathedral Square …’ I let it go like that because I didn’t want to change things at that point. People were gathering around us, first in a wide ring, then closer. Chelsea sat smilingly down on the platform, and I figured I had to get as close as I could to be properly heard. Serenading Chelsea in the middle of Portland’s Union Station. Of all the songs on the trip this one was laser-etched upon us and created a steel-cased bond. It’s a song of love, of friendship, gratitude, and hope symbolizing the hidden treasures of the ROTR* experience. Love comes in surprising ways, and often on the wings of a simple song. I’m sitting next to Trinity in the dark on top of a train hurdling toward Oakland, California. We’ve just been informed that shrimp cocktail with humus and crackers are waiting downstairs which has enticed Trinity to leave our nest above the rail car and walk down to investigate. Upon her sudden return, she informs me that she has purloined only crackers, without the humus or the shrimp. She doesn’t like humus, was expecting cheese, and seems rather disappointed that cheese is not an option. As for the shrimp, she simply wrinkles her nose, closes her eyes, and shakes her head definitively. She returns to her perch beside me and together we sit and watch the night roll by. Trinity is my new friend from Vancouver, B.C. 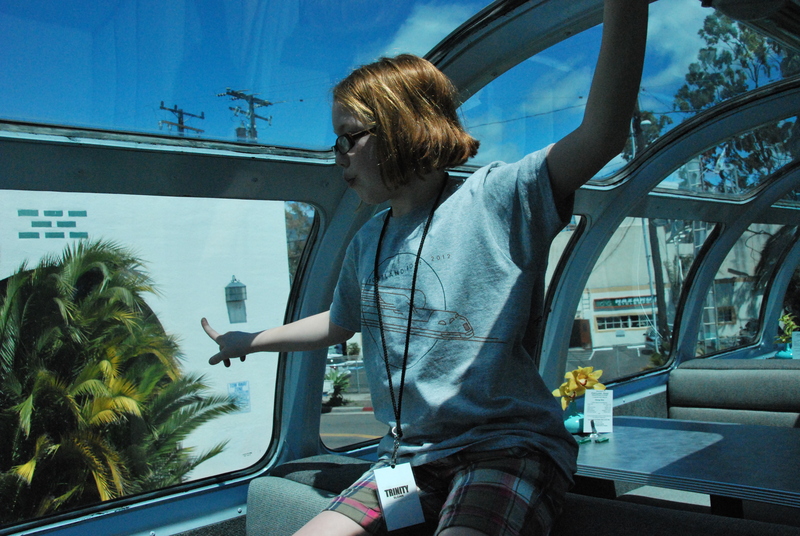 She’s 9 years old and is accompanying her family, exclusively clenching the honor of the youngest passenger on this trip, her shock of copper hair and bright green eyes a beguiling vision. 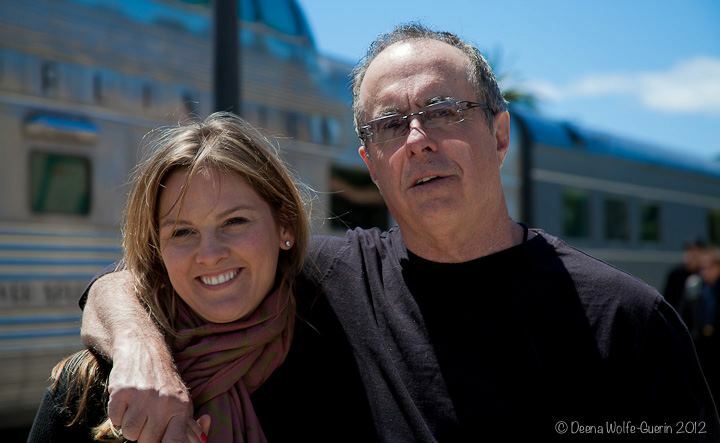 We became immediate friends when, standing in L.A.’s gorgeous Union Station, she stared up at me with those eyes and her big toothy smile and boldly asked my name. Baring her generous soul and sweet youthful wisdom gathered from her relatively short but eventful existence, we’re sharing this unique experience with great anticipation. The ecstasy of the journey itself. Trinity and I agree that this is the best seat on the train and we’re both genuinely sorry for the passengers on the cars in front of us. 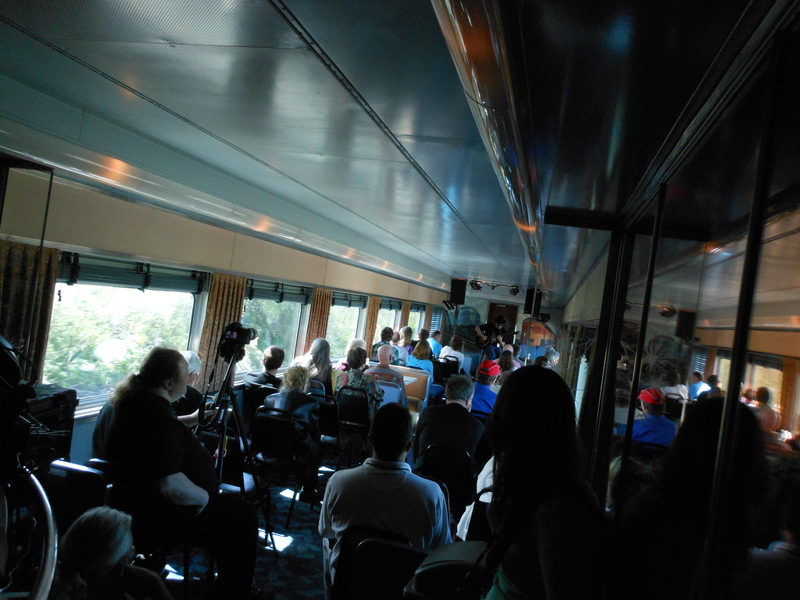 With no idea of our stealthy perch behind them, inhabiting 5 private cars attached to the back of their generic, modern Amtrak vessel, they are likely being lulled to sleep without the incredible view that surrounds us now. Most folks don’t know about the fleet of privately owned rail cars that crawl across our continent, hitched opportunistically to the rear-ends of regular trains heading somewhere. I’m told there are only 100 of these Amtrak-approved treasures in existence. 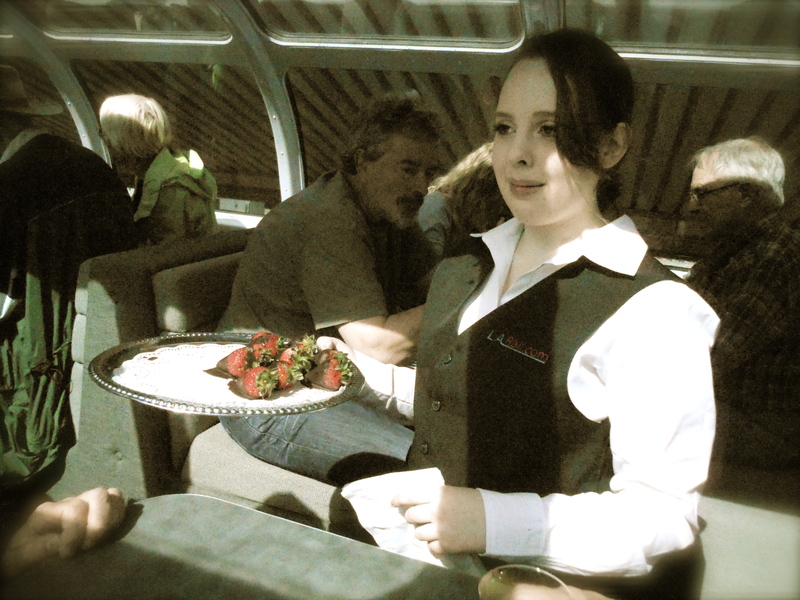 Our meticulously restored rail cars are relics from the past, the time of our grandparents, with current owners who are passionate and dedicated. 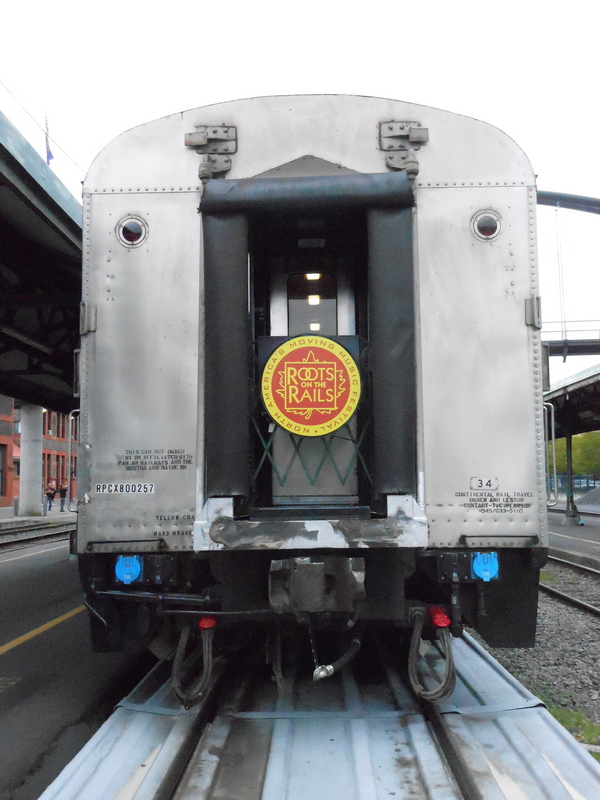 They generously share tales of the luscious history of these rail cars. Made of Stainless Steel, they are both immortal and precious. We’ve all boarded this train staunchly ready to renounce the modern sleekness of the newer cars. We’ve slipped into a timelessness that stretches the moments into long taffy-like strands of amazement. Every second delivers more beauty than we can devour at once. I’m tempted to store them away like a squirrel with nuts for a later meal. 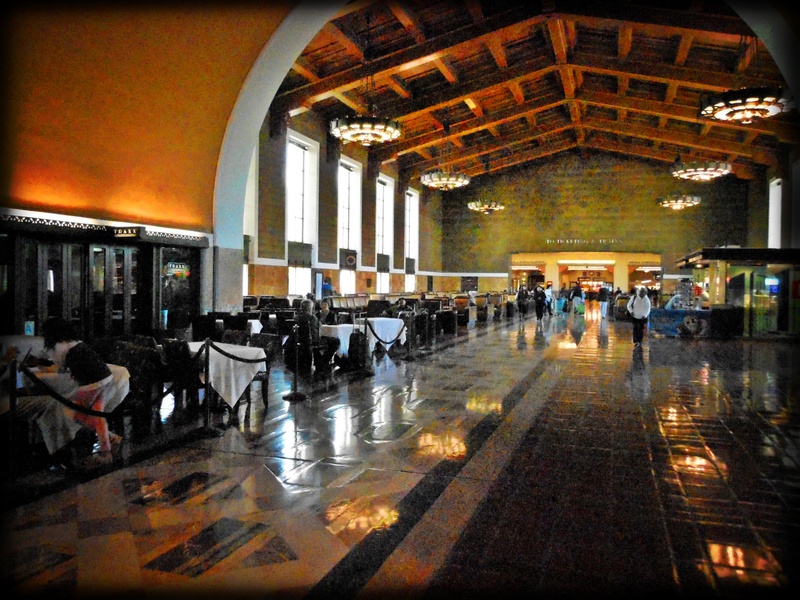 As the night stars fly past us, my thoughts drift to earlier this morning walking through Union Station in Los Angeles. Having left our baggage with friendly porters, hauled behind their tiny trams on rickety carts, the sheer magnificence of the station itself delivered the perfect send-off. This is where our journey began. Our journey to the Roots. This trip is all about Roots. We’ve joined a “Tribe” they call Roots on the Rails. My fellow intrepid vagabonds and I are in pursuit of an uncommon Americana in all of its available forms, but mostly we are in search of music. A chosen few charming and talented minstrels have joined us, providing a foundation steeped in stories intertwined with delicious melodies. They are legends themselves, troubadours of a kind of art form spinning yarns in musical cocoons. The first of our rail cars dedicated to musical performances, our official temple of music, awaits sacrosanct and pristine. The next car, #2 in line, is for food and revelry, complete with a glass-enclosed viewing area sitting majestically above all other cars. The rest of these delightful cars efficiently transport our sleeping pods. As we wind our way up the coast of California bound for Portland, our journey takes us off the beaten path, to coastal views only shared with the local wild life. 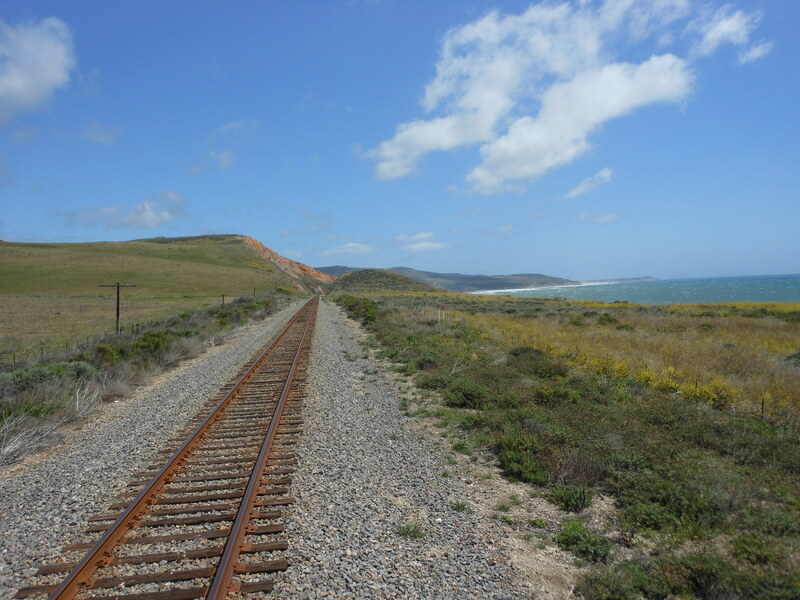 These tracks are far from the busy highways, crisscrossing the miles the way they always have. They are partially abandoned, discarded by our speed-drenched manic lifestyles. We’ve lost the luxury of the past. Our predecessors traveled on these trains. Their lives were so much richer, devoid of the demands of time and space, Technology and its sister, Speed. I’ve wandered into an alternate reality, contained within a bubble of time and space, wrapped in an exceptional time machine. 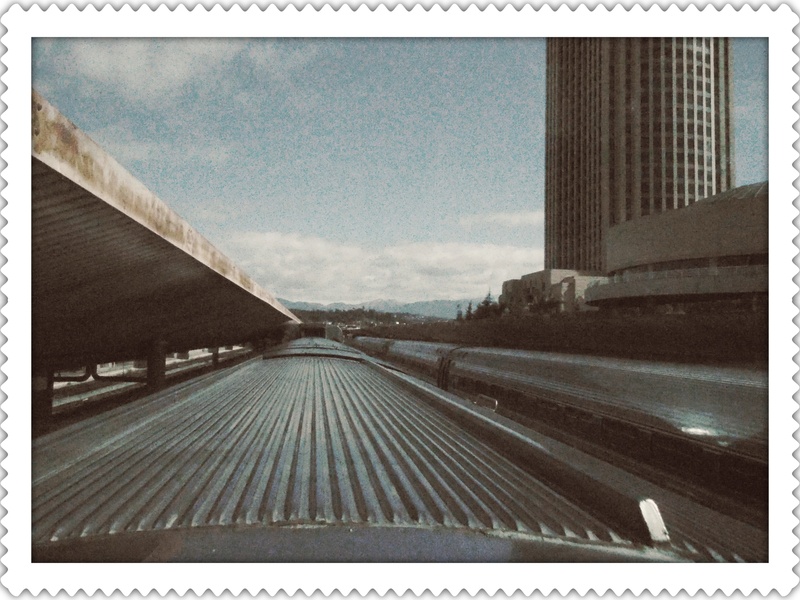 Riding on a train delivers a perspective that’s missing in other modes of transport – you find plenty of time to think. Contemplation slowly engulfs me and I realize that pondering is an art and this train is filled to the brim with artists. 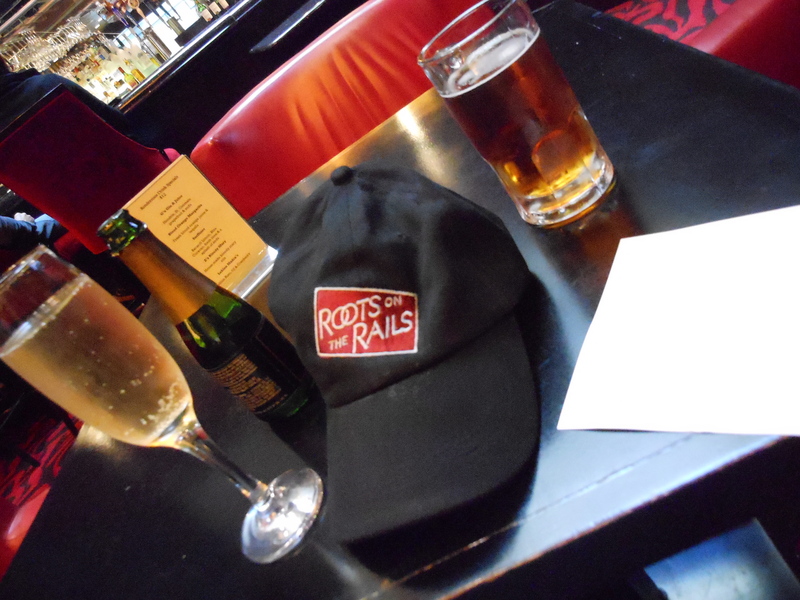 My eternal gratitude goes out to the folks at Roots on the Rails and LA Rail. 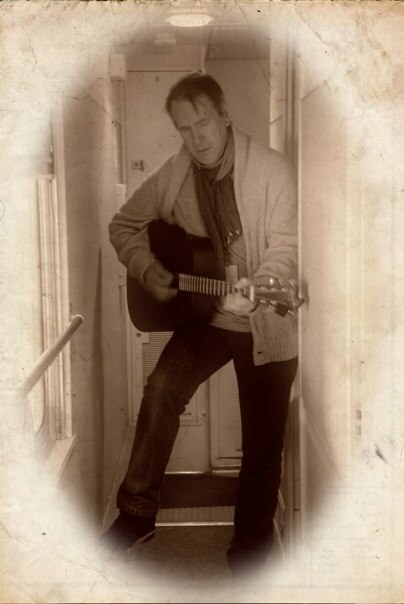 More about the amazing musicians to come in later entries….